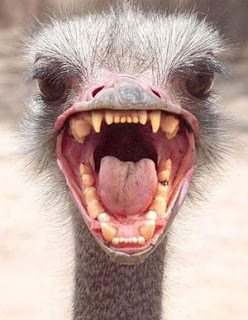 Behold the glorious ostrich; famous for being damn ugly, being flightless and for the myth that it hides it's head in the sand. Some IT managers subscribe to a similar theory for information technology. The theory is that the best IT is performed by a crack team of supergeeks that are allergic to the sun. They favor pasty skinned uber-nerds incapable of normal human interaction. They look for people with only enough social skills to engage in a game of Dungeons & Dragons. Obviously this is a disaster for your business. We are far past the time when it was acceptable for the IT department to be unable to communicate with other business departments. It's alright if the worker nerds are unable to talk to regular people, but you need to expect much more from the manager. The IT manager must be a valuable business partner. Someone who can clearly communicate the benefits of new technology and how it can help your business. You need someone proactive. You need someone that steps out of the IT closet and engages with your employees. You need someone who understands your business and is willing to help identify the problems, especially the one's you didn't know you had. Too many traditional IT managers are just glorified tech nerds. They don't want to interact with people either because they're socially awkward or because they just don't care. So, they bury their heads in the sand and hope that someone else will tell them what to do. That's not management. And that is certainly not leadership. Yet I see this exact behavior far too often. I've met CIO's making over $250k that practice this strategy. The attitude they bring to the table preaches a minimalist approach. Don't get involved, don't take risks and you won't get in trouble. But a good leader understands the value of calculated risks. A great leader understands that success is impossible without risk. And that means you have to engage problems head on. That means getting out of the IT closet and getting your hands dirty. You should expect more from your leaders. At the very least you should expect that they not engage in failed IT strategies. For a complete audit of your IT department, contact me today.